At Global Pharmacy Plus we believe that everyone should have the access to low cost stop smoking aids. We have sourced several stop smoking products to aid in quitting smoking. Below you will find Name Brand Chantix Starter and Maintenance packs by Pfizer. 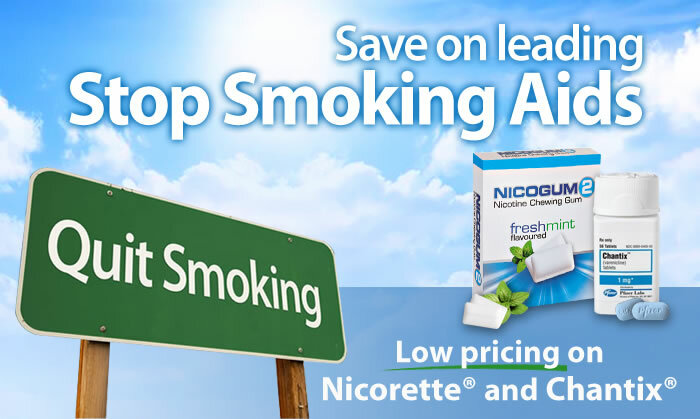 We also carry a Nicorette alternative called Nicogum, Nicogum works the same as the brand name product Nicorette and comes in the same proven dosages of 2mg and 4mg per gum. Varenicline, is used to help people stop smoking. Varenicline is in a class of medications called smoking cessation aids. It works by blocking the pleasant effects of nicotine (from smoking) on the brain. Bupropion HCl, is the generic form of Wellbutrin SR. Global Pharmacy Plus offers you Bupropion HCl in Generic form Wellbutrin SR®(Bupropion HCl) is used to treat depression and seasonal affective disorder .